As I step down from my Thursday–Friday rest days, I look up with excitement about my new Sunday–Monday days off which kick off today. I’m grateful for every day, but I think nothing beats Sundays spent with family and neighbors back home in Malabuyoc. And as I go this morning to the bus terminal, I can’t wait to uproot my hair, purge my dress, and toss away my shoes upon arriving home four hours later, and then shovel off all the four yards around to continue with my newfound passion: landscaping. I’ve listened to different versions and different arrangements of this meaningful song titled “Home” by different artists, but, just like Pia Wurtzbach, from a bevy of seventy-nine other beauties onstage at the Miss Universe 2015 pageant, this one by Asia’s Songbird Regine Velasquez stands out. It is, indeed, a testament to the fact that Filipinos are world-class in many ways: beauty, talent, and what have you. Shouldn’t we all be mighty proud that we belong to the same home, the powerhouse of beauty—and talent, if you will, where “there’s love overflowing” and beauty overwhelming? For the year 2015 alone, we won six international crowns. Tell me which other country can beat that? Ten days after Pia Wurtzbach ended our four-decade drought for the world’s most coveted crown by winning it at the 64th Miss Universe pageant, Leren Mae Bautista bested fifty-six other beauties by winning the title of Miss Tourism Queen of the Year International 2015 in Malaysia. On Dec. 5, Angelia Gabrena Ong put the Philippines on the map once again in Austria by succeeding fellow Filipina Jamie Herrell with her victory as Miss Earth 2015. Once week prior, on Nov. 27, Cindy Pacia Madduma wowed the world in Malaysia by winning the crown of Miss Scuba International 2015. On Nov. 6 in Thailand, Trixie Maristela was crowned as the most beautiful transgender in the world by winning the Miss International Queen 2015 title. And the first one to do it all is Ann Lorraine Colis: she bagged the Miss Globe 2015 crown on October 8 in Canada. Click the link to listen to the song and watch the video. Since our queen, Pia Alonzo Wurtzbach, is currently in the thick of her homecoming to the Philippines, I find it totally relevant to share the last few remnants of my Miss Universe 2015 thoughts. That’s as if I can get enough of my Miss Universe mania!? Olivia Jordan looked divine in her hot pink couture gown. Her hairstyle, to me, was nostalgic for 1950s, which I loved. She reminded me of Miss Universe 2009, Venezuela’s Stefania Fernandez who went to the Bahamas bringing her signature retro mien, and Miss Universe 2004 first runner-up, USA’s Shandi Finnessey, whom I personally consider as my first favorite blond beauty queen. Olivia’s performance during the Q&A was flawless, to say the least—which was understandable and, for me, expected of every pageant contestant whose first language is English. She’s not a boring blond beauty, and she looked as though she was born and bred and bound to stand out from a sea of fellow blondes onstage come pageant night on Dec. 20, 2015. I held on to that, and because our country’s delegate, Pia Wurtzbach, was also a force to reckon with, I imagined them both as the last two standing beside the host announcing the first runner-up and the Miss Universe 2015 winner. But as though luck preferred to sit on Pia’s lap, Olivia’s styling at the international pageant was a way far cry from her Miss Universe-prepped pulchritude during her national Miss USA 2015 competition—which I found ironic, because she looked as though she’d flown in to Nevada from Oklahoma to attend a bridal fashion show. I wonder: What if Olivia Jordan had walked on the Miss Universe 2015 stage at the AXIS in Las Vegas wearing the same gown, hairstyle, and makeup she’d worn when she won at the Miss USA 2015 pageant in Baton Rouge, Louisiana? What if, during the Final Question, she was visited by her superb confidence level at the national competition when she gave her answer to the question about an American woman to appear on the $10 bill in the year 2020? What if. . . . ? Just as I had stood for the invocation and was about to remain standing for the national anthem, my favorite Ceres Tours bus came into sight. I was in Brgy. Sto. Nino of Malabuyoc yesterday afternoon hoping to get a glimpse of this year’s Sinulog Festival before I was to travel back to the city. I hopped into the bus, which was paused by the driver for a couple of minutes: in order to pay respect to our national anthem which was still being sung during the opening of the program. 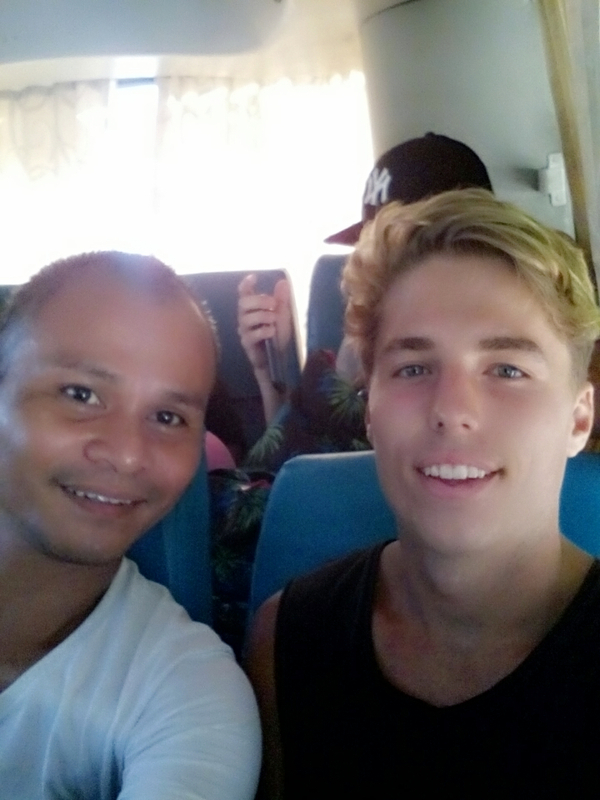 The driver’s singing along gamely out loud inside the bus made most of the passengers, including my handsome seatmate from Down Under, laugh and ask what’s going on outside. I explained. And then I introduced myself to him, whose name is Chaz, as well as to his older brother Jake who was seated at our back but cool enough to chime in with us in our conversation. They were both cold and exhausted, I was told. Can you imagine waking up at five-thirty in Bohol to be able to catch the early-morning fast craft sans enough sleep the night prior and to take the bus to Oslob right away upon arriving in Cebu for the must-watch whale sharks and then another bus which we’re on for a few days of beachcombing or swimming or scuba-diving in Moalboal? Sleepy would be the perfect word to describe these hottest brothers I have ever seen together. But even as they were short of sleep and rest due to nonstop wayfaring or seafaring or flying or sightseeing from the day they set foot on Philippine soil two weeks ago, they looked uber fresh I couldn’t understand why. Chaz, my seatmate who’s nicknamed himself as Jake after his brother, was incredibly gracious because even if he was too tired to carry on with a conversation, he bore with me as I kept pestering him with any questions and topics I could think of to kill time while the bus didn’t arrive yet at his destination, Moalboal. I had to keep apologizing because I couldn’t help telling him to his face every now and again how hot he and his brother were, and how jealous I was of their vivid blue eyes. “You know what, you are really very hot, and you have to forgive me if I can’t keep my eyes off of your eyes. Tell your brother that I think he is a dead ringer for his own namesake, Jake Gyllenhaal. If both of you lived in the Philippines, for sure you would become two of the country’s sought-after models in no time,” I said. “Thank you. You don’t have to apologize for being honest because that’s such an admirable trait you have. I, too, can’t believe that you’re forty-one years old,” said Chaz. “No, Ariel,” the nineteen-year-old International Business graduate was quick to say that I looked way younger than my age and added jokingly that “yes, you looked a little like Miss Universe 2004 Jennifer Hawkins” from his home country, Australia, when I said that I can only wish I had a little resemblance to her because she’s one of my favorite Miss Universes. “Delicious? What a choice of word! Let me also tell you that one of the best things about traveling to your country is that Filipinos are very hospitable and welcoming. Thankfully, my brother and I haven’t had any bad experience here, and we hope that we won’t. 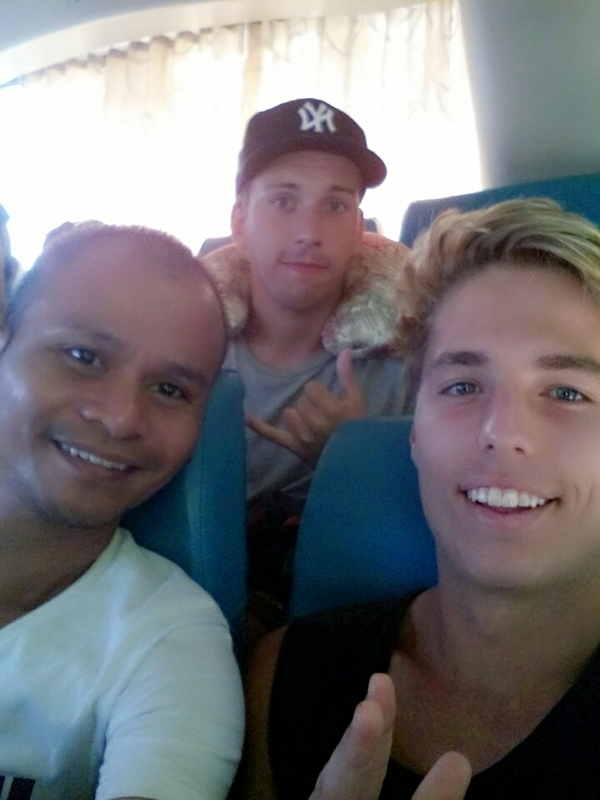 We’ve been to Manila, Palawan, and Bohol. 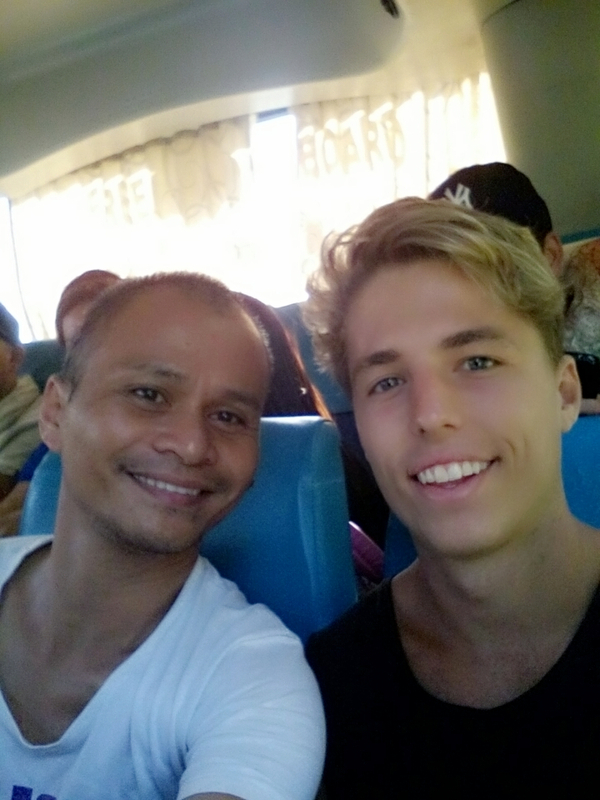 From Cebu, we will be flying out to Boracay and to other places before going back home to Melbourne,” Chaz said. “Look, you’re talking to me now—which is a very good example of the warmth of Filipino hospitality,” Chaz smiled.